Islamabad, July 6 (Just News): A Pakistani court today sentenced ousted Prime Minister Nawaz Sharif to 10 years in prison over his family's purchase of upscale London flats in a major blow to his party ahead of a general election in July. The guilty verdict in absentia against Sharif, 68, threatens to end the career of one Pakistan's most high-profile politicians over the last four decades, a political survivor who served as prime minister on three occasions. Sharif's daughter, Maryam, widely seen as his chosen political heir, was sentenced to seven years in prison. Maryam's husband and PML-N lawmaker Muhammad Safdar was sentanced to one year in prison, prosecution lawyer Sardar Muzaffar Abbasi said. Abbasi added that NAB court ordered Sharif to pay a fine of 8 million pounds ($10.6 million) and Maryam was fined 2 million pounds, while ordering the confiscation of the London properties on behalf of the Pakistani government. Both Sharif and his daughter were in London on Friday with Sharif's wife, Kulsoom, who is being treated there for cancer and is in a coma after suffering a heart attack last month. 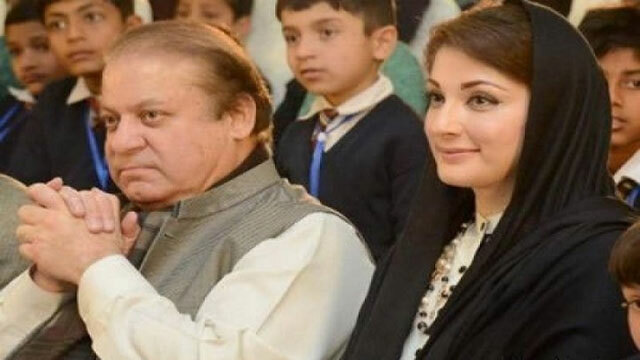 The National Accountability Bureau (NAB) court accused Sharif and his family of being unable to legitimately show the money trail for the purchase of several luxurious properties in London, mostly in the mid-1990s. Sharif was ousted by the Supreme Court in July 2017 and barred from politics for being "dishonest" by failing to report a monthly income of 10,000 Emirati dirham ($2,723) from a company owned by his son. He denies drawing the monthly salary. But he has kept control of the Pakistan Muslim League-Nawaz (PML-N) party that he founded. The decision against the Sharifs comes at a time of intensifying suspicion of military meddling in politics ahead of the July 25 polls, as well as media complaints that the press is being muzzled. Sharif had denounced the court proceedings against him as politically motivated and a judicial witch-hunt, often suggesting the hidden hand of the military was to blame. Hours before the verdict, Maryam's husband Safdar referred to it as a "funeral" for justice, the PML-N media office said in a statement. "It is to be seen if this decision is written by a judge or a general," Safdar said. The military, which has ruled the nuclear-armed country for almost half of its history, denies involvement in civilian politics. But the military ended Sharif's second stint in power in 1999 in a bloodless coup. Sharif has a history of conflict with the military even though his political career was initially nurtured by military dictator Zia ul-Haq in the 1980s. He fell out with powerful generals once he ascended to power a decade later, and the relationship between them was fraught after Sharif returned as premier in 2013, partly because Sharif challenged the military over control of foreign policy, which the generals have traditionally seen as their domain. Sharif has argued that the military, in cahoots with top members of the judiciary, has used a series of cases against him and others in his party to tip the scales in favour of cricketer-turned-politician Imran Khan in the run-up to the election. PML-N officials also accuse the military of using its muscle to twist the arm of the media to restrict coverage of criticism of the judiciary and military by Sharif and his allies. Sharif's younger brother, Shehbaz Sharif, who has taken over the PML-N leadership, said on Thursday recent action by the anti-graft National Accountability Bureau and the judiciary had cast doubt over the election.